The California climate and affordable housing lured many East European Jews, seeking a better life during the mid-twentieth century immigration wave, to settle in Los Angeles. One such newcomer was Israel Levin. Sadly, there isn’t much background information available on this man who made such a vital contribution to the history of Jews in Venice. According to Rosalie Fromberg, Director of the Israel Levin Senior Adult Center, he was part of a group of elderly Jewish immigrants who met in a storefront on Pier Ave. in Santa Monica in the early 1960s. He decided that the seniors needed a more appropriate place to meet and in 1964 purchased what was then a two-story bingo hall at 201 Ocean Front Walk. When he passed away, the Israel Levin Senior Adult Center was willed to the Jewish Federation of Greater Los Angeles. According to Steve Sass, President of the Jewish Historical Society, Mr. Levin died in 1971 at the age of 97. At that time the Jewish Federation did mainly fundraising and little programming. The Center was leased rent free to the Senior Department of the Bay Cities Jewish Community Center under whose auspices it remained until 2002. Now it is part of Jewish Family Service and is officially known as the JFS/Israel Levin Senior Adult Center. The Center became widely known when Dr. Barbara Myeroff, an anthropologist and writer co-produced with director Lynn Littman a film called “Number Our Days,” based on interviews with members of the Center, that is a sensitive and compassionate portrayal of individuals whose heritage of hardship is paired with their ability to rebound while at the same time living among poverty and isolation in their new homeland. It won an Academy Award in 1977 for Best Short Documentary. A book with the same name was published in 1979. A daily kosher lunch for $1.25 is provided by JFS/Hirsh Kosher Kitchen. Free oranges and bananas are given to members every Friday through a grant from the Mitchell Family Foundation. The Jewish Federation still owns and maintains the building. Jewish Family Service, the parent association, provides a social worker who comes once a week to offer resources and services like assistance with prescription drugs and filling out rebates for housing and to lead a discussion group on issues that pertain specifically to seniors such as knowing when to give up driving. A man, not even a member, left money in his will to provide for senior programming. His largess is used for wellness and cultural programs including transportation. Seniors have taken cruises to the Mexican Riviera and Alaska, gone to Las Vegas, Laughlin, San Francisco, Morro Bay and Palm Springs and been on one day excursions to museums. They go to the theater where they have seen Jersey Boys and Wicked. The Harold Edelstein Foundation provides money for holiday gift baskets in December for the really needy. Temple Mishkon Tephilo offers discounted tickets for High Holiday services. The Venice Library and the Santa Monica Library have been generous in donating books, especially those in large print because there are seniors who have macular degeneration. Many young people have preconceived notions of what the elderly look and act like. “They picture older people sitting in wheelchairs drooling and not understanding things,” says Rosalie. “We have seniors who walk two to three miles every day.” This vital group of seniors brings wisdom, insight, memories and, of course, experience. There are occasional intergenerational programs. “I explain that these are older people who have college degrees, which is really phenomenal considering that generation, and who were teachers, principals and lawyers,” says Rosalie. So, the next time you see an older person treat them with respect because you, too, will be walking in their shoes someday. 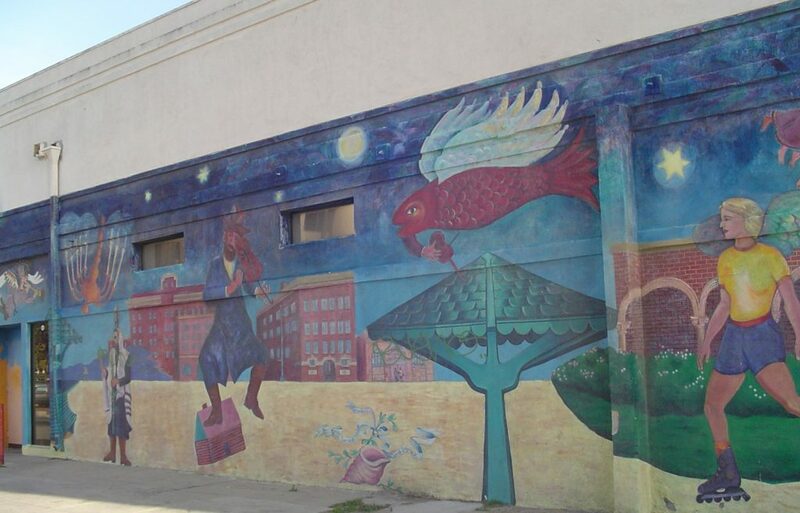 In 1991 a mural, Marc Chagall Returns to Venice Beach, was painted on the exterior of the Center. Christina Schlesinger was lead artist along with thirteen assistants, one of whom is current member Fay Conn who painted a section showing her parents going into a synagogue. Much of the imagery comes from the work of Russian Jewish painter Marc Chagall dropped into a setting of Venice Beach. To make a donation, volunteer or for more information please call 310-396-0205.